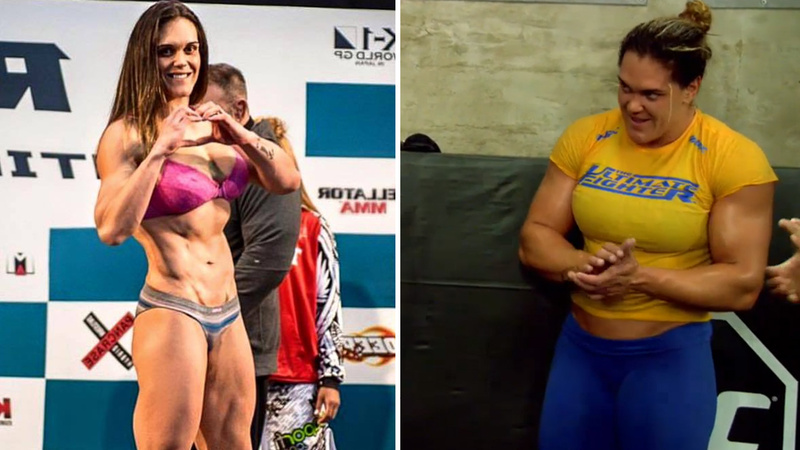 Home Misc Gabi Garcia – From Old-Ladies Killer To Historical Weight Cut Fail Expert! 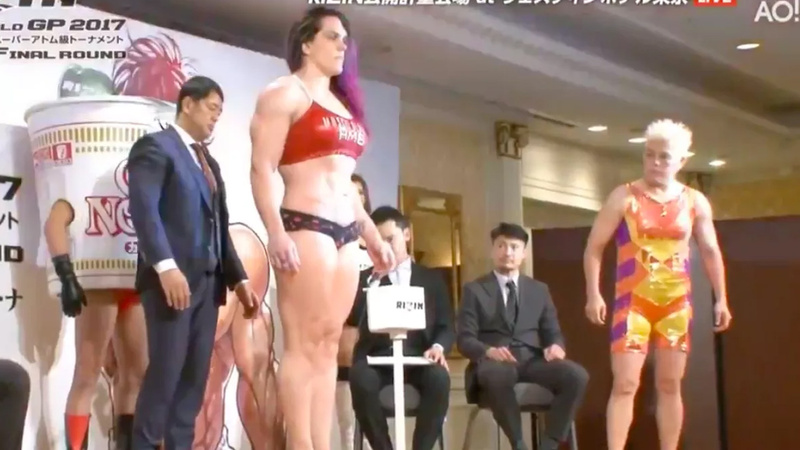 Gabi Garcia is a real giant inside the octagon – she is 1,88 meters tall. But she has a very soft heart, and she is a gentle lady who needs love and understanding outside of the octagon. She doesn’t trash talk but hates provocations. Gabi Garcia is currently 33 years old and weighs 236 lbs. Her real name is Gabrielle Lemos Garcia. She is also a star for illegal head kicks, superb submissions, a tremendous display of power, steroid accusations, and soldier mentality. Now her fighting style controversies – she is a BJJ black belt and the former grappling champion of the world. But when it comes to striking, even CM Punk isn’t that funny. It looks like a beginner who spams punches, and her right high kick is everything but a kickboxing or Muay Thai technique. Gabi’s fists are similar to a bad version of a hooligan – no defense, no technique, hands flying randomly! Luckily, Gabi Garcia (5-0, 1 NC) can overcome this shortcoming with a tremendous power and strength. But take a look at the position of her hands in the guard. As soon as Gabi attacks she is wide open! Her fight versus Lei D’Tapa at Rizin Fighting World GP 2015: Iza no Mai on December 31, 2015, should have been a New Year’s spectacle but it turned to a street bully showdown. Lei rocked her hard but Garcia used her supreme power to get back on her feet and knock her down with a backfist!!! Yeah, you read well, this is a street bully attack which Gabi Garcia did. Her striking was terrible but the ground and pound strikes were extremely funny – she was holding her gigantic left hand on Lei’s face while the right one was sending her to sleep. Gabi’s hand was a lot bigger than the opponent’s head! Gabi Garcia probably had confusion between Shoot Boxing and PRIDE rules. In her fight against Megumi Yabushita at Shoot Boxing Girl’s S-Cup 2017 on July 7, 2017, Garcia crushed her skull with a world-class soccer kick in the style of Wanderlei Silva. But this isn’t PRIDE, her opponent didn’t get up and the fight was overturned to no contest! And Gabi knocked her down with a right hand previously, what a childish mistake! You know what is the strangest thing? Gabi Garcia was warned by the referee for an illegal kick the first time but looks like she forgot about it completely! Maybe she got lucky with no contest due to “I don’t speak Japanese” thing. Despite Gabi Garcia was pure Goliath compared to Oksana Gagloeva at Rizin World Grand Prix 2017 on July 30, 2017, the fight was stopped after only 16 seconds due to an illegal eye poke! The fight was overturned to no contest before it even started! And for the end, in the fight versus Yumiko Hotta at Rizin 4 on December 31, 2016, Gabi Garcia looked like a cop chasing thief around the ring. She even grabbed Hotta off her back. Gabi didn’t hold guard at all while she was landing right-hand punches… if you can call it that way… and won via TKO. Joe Rogan wrote “WTF Japan” on his Instagram. According to Joe, Gabi was fighting 50-year-old women who looked so scared and paid for a trip from Hollywood to Japan. And of course, Joe didn’t have praises for her striking. Gabi Garcia had the most epic weight fail… probably in the whole history of female MMA. She had 237 lbs for her 209 lbs fight versus 53-year-old Shinobu Kandori in December 2017. Their fight was canceled only a few hours before the fight and might be rescheduled for 2018. Everybody can miss few pounds, but 28?! What the hell was Gabi thinking of? Brazilian BJJ superstar offered an apology after she failed weight cut process. She said that she had to stop because it nearly killed her. In every training session, her nose was bleeding, and her vision went dark once she started shedding pounds. Apology or not, Gabi holds a negative record! And what would have been the controversy without Joe Rogan? He accused her of “clearly taking male hormones”. Joe has no proof but he based his statements on the signs of steroid abuse and his own experience with performance-enhancing drugs. She demonstrated her world-class BJJ skills in her fights versus Destanie Yarbrough (Americana), Anna Malyukova (armbar), and Veronika Futina (rear-naked choke). She looked more than dominant in the match versus Futina at Road FC 047 on May 12, 2018, mounting her back and securing the submission victory. This BJJ specialist knows to choke you out or trap your limb. We hope this giant will eventually get a chance to be called the King of Heavyweight division sometimes. But she has to put her striking to the next level, reconsider her weight, and try to find some real opponent. I mean, Gabi Garcia is a very good friend with Cris Cyborg, who is probably the best female striker in the world, she could start learning from her! In the meantime, let’s hope UFC will consider Heavyweight division for women, maybe this gentle giant could bring tons of money, thrill, and visits!